Climbed on June 15, 2008. 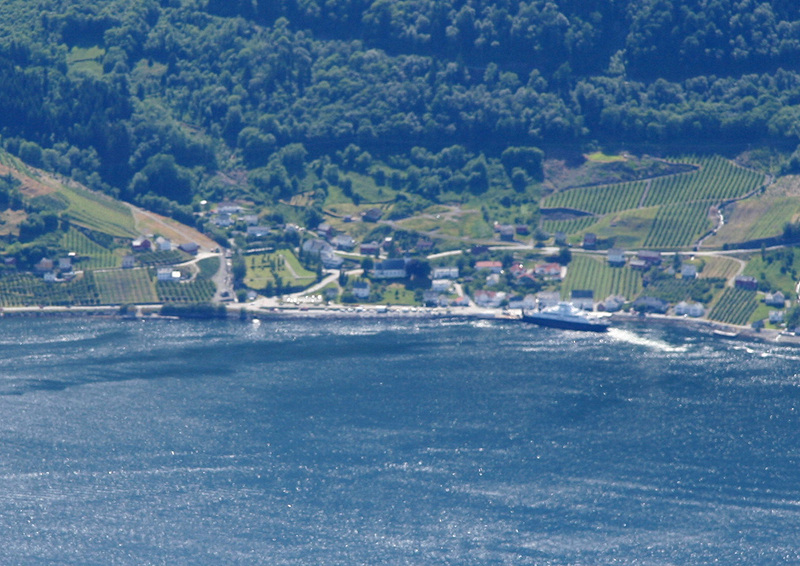 How to get there: From Bergen, first drive to Granvin, a village on the Hardanger fjord. One can either drive via Voss or take Hwy. 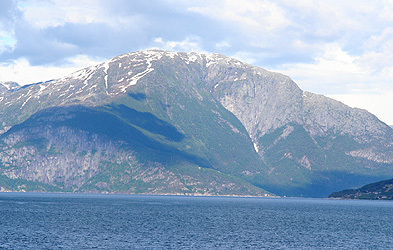 7 along the north side of the Hardangerfjorden. This takes about 2 hours. In the center of Granvin, locate the side road that serves the east side of Granvinfjorden. The sign says "Hamre 7.5 km". Take this road, that quickly becomes a good dirt road, and drive 3.2 kilometer from the intersection. You should spot the sign "Oksen" that points uphill. There is parking for 2-3 cars immediately on your right side. Park here, this is the trailhead, location N60:30.176, E006:41.836, elevation 34 meter. Route description: The trail starts out along an old fence. This trail is not very big, but one should be able to see it all the way up through the forest. 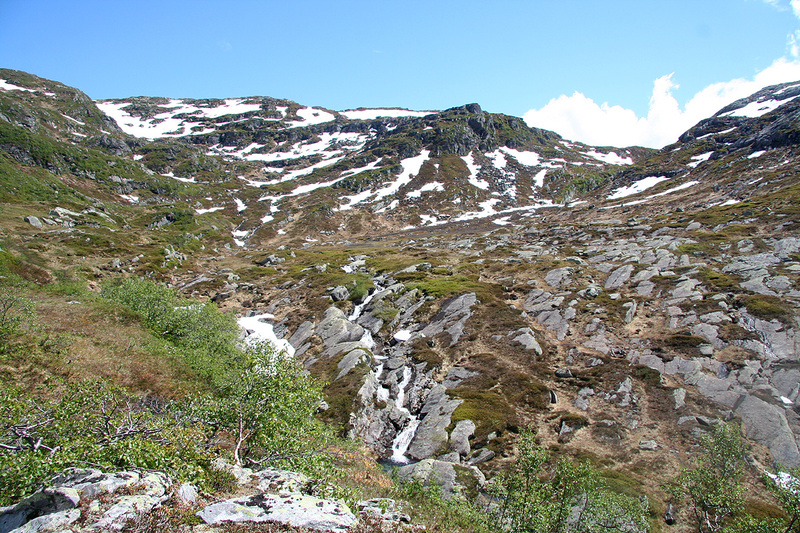 Soon, you cross a small creek, then enter a nice ridge that continues uphill. Above the ridge, the trail continues in zig-zags up the steep hillside. There are pretty big pine trees in this area. Higher up, the trail traverses right, then descends a bit and crosses just below a small waterfall. The trail continues a bit more downhill in order to traverse into the upper part of Verkadalen. The trail continues up Verkadalen, staying on the left side of the creek. You get above the treeline at location N60:28.739, E006:42.310, elevation 750 meter. 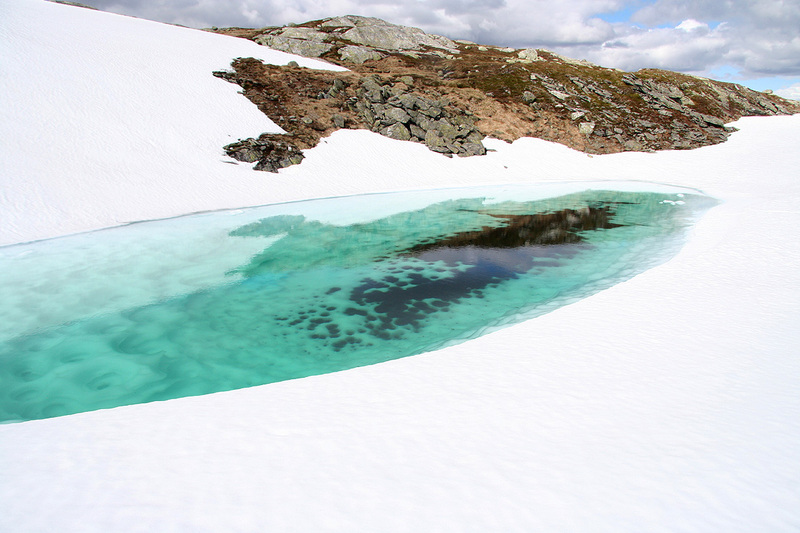 From here, you turn into the basin and follow the main creek up to the small lake Oksatjørni (895m) with the cabin named Larsbu. 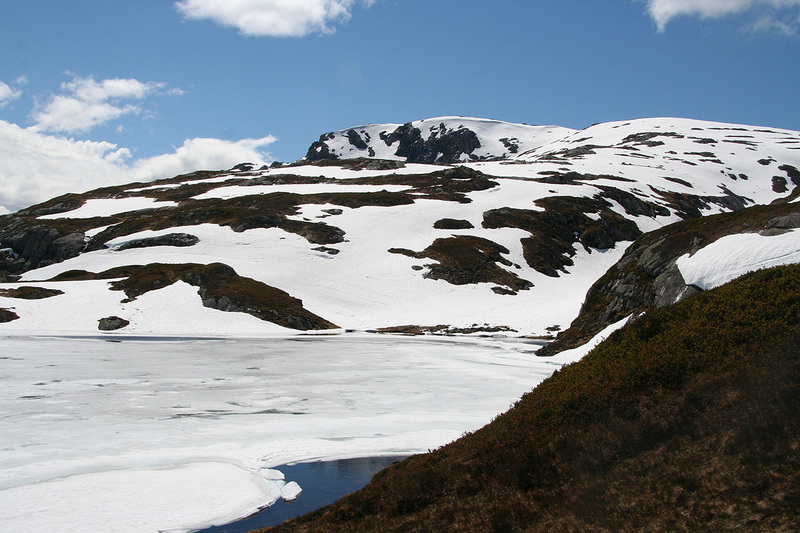 Walk around the lake and head upo the broad ridge to the summit of Oksen. 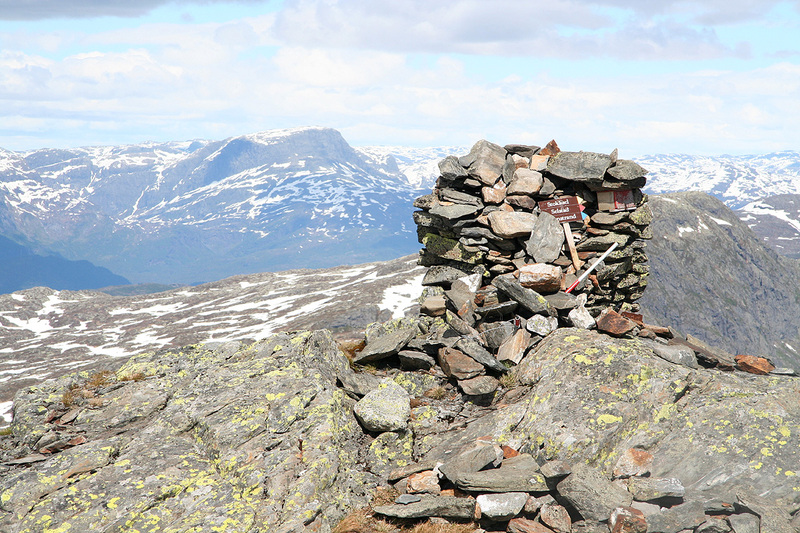 Oksen has two summits, the one with a slightly collapsed cairn and a summit register is marked at 1241 meter. Further southeast is another summit (and good viewpoint) that my GPS recorded as equally high. 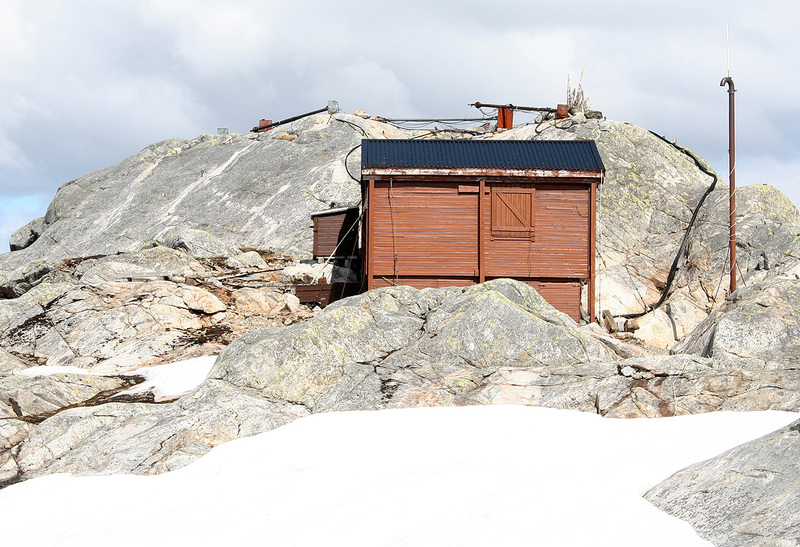 There is a hut there and quite a mess with metal antennas. Whoever is responsible for this should clean up the area. 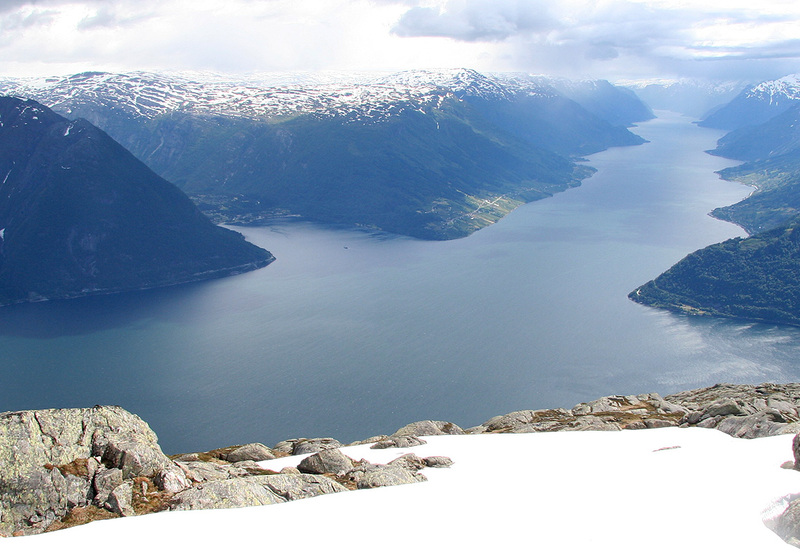 The view from either summit is very nice as you see different parts of the Hardangerfjord in several directions. Comments: This is a very nice hike to a very nice view point. I climbed this peak solo. Starting from my car at 1240, I reached the summit at 1510, two and a half hours. The weather was nice, but more clouds around than expected from the forecast. I explored and took several photos from both summits. 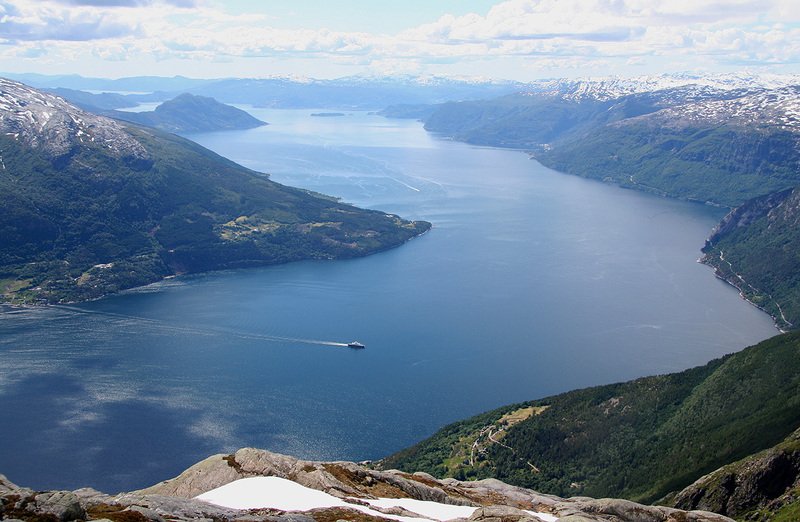 The view of the Hardangerfjord is unsurpassed. 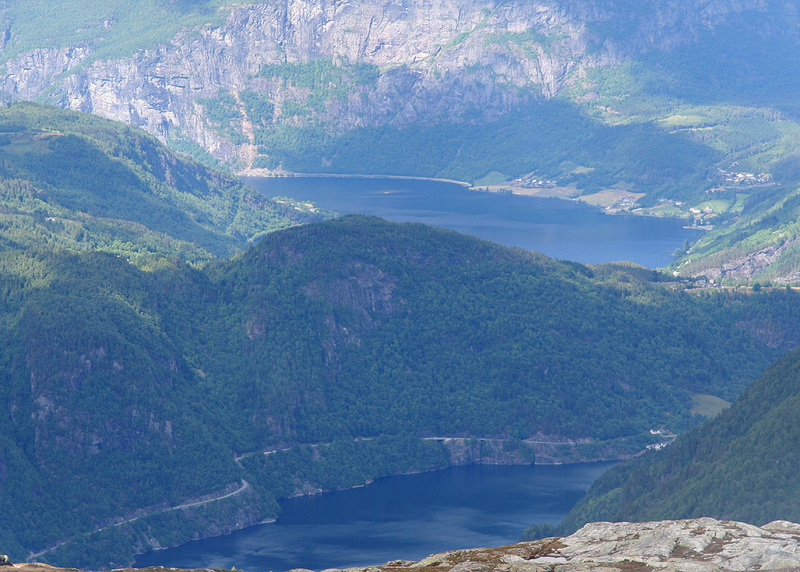 Looking towards Eidfjord, there will soon be a large bridge across to Buneset (middle of the picture). 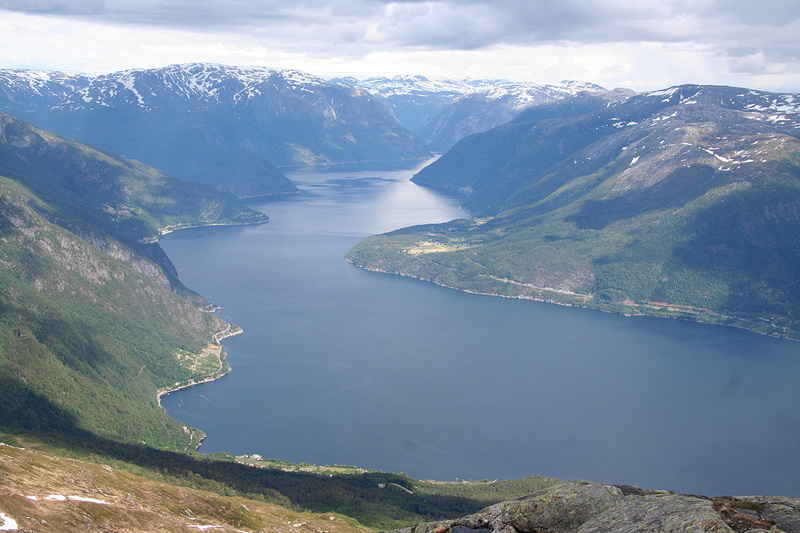 One also gets a pretty straight view down the long Sørfjorden finger of this complex fjord. 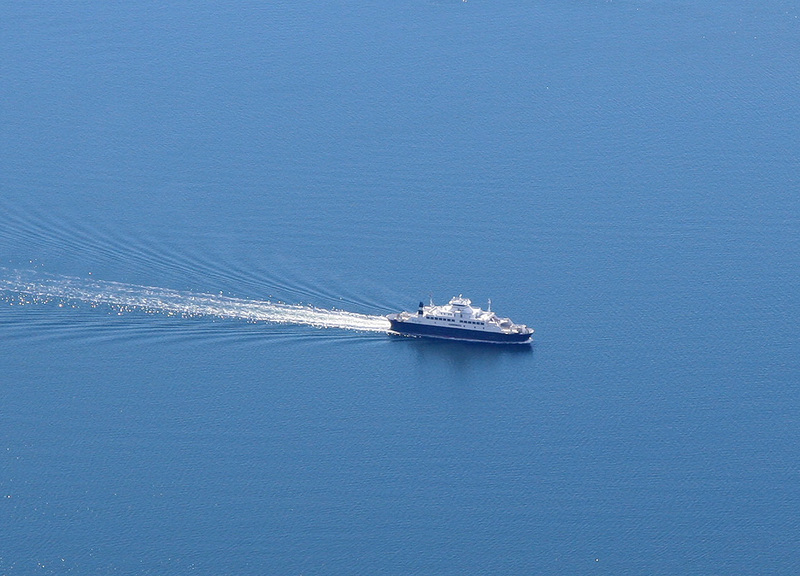 The ferry between Utne and Kvanndal looked like a toy when seen from this summit. At 1555, it was time to head back down. I could follow continuous snow all the way down to the 800 meter contour. Back at the car at 1740, that is descending in 1:45. Oksen, seen from Hwy. 7. Oksen, as seen from Larsbu. 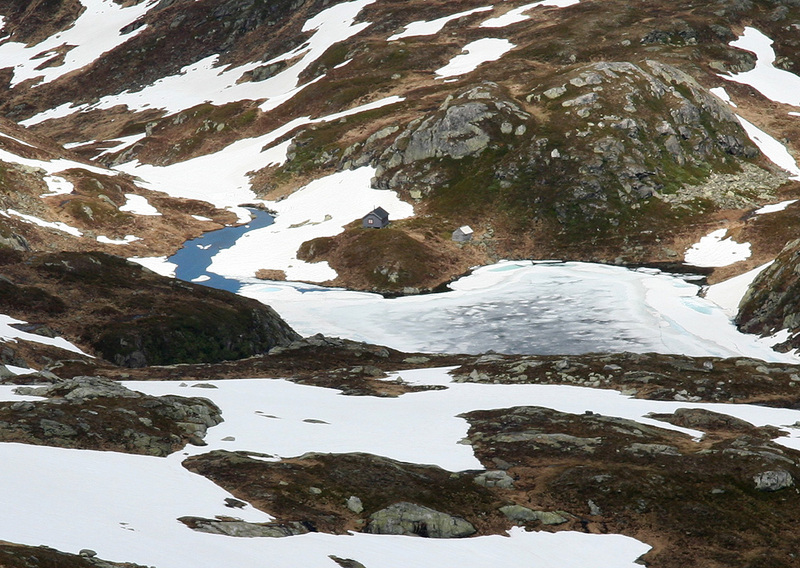 Granvinsfjorden and Granvinsvatnet, as seen from Oksen. The summer is coming, seen on my way back.